Rabbits that remain indoors may suffer from a lack of vitamin D, researchers report in a new study. In rabbits kept as pets or used in laboratory studies, the deficiency could lead to dental problems, undermine their cardiovascular health, weaken their immune systems and skew scientific findings. The study found that regular exposure to artificial ultraviolet B light for two weeks doubled rabbits' serum vitamin D levels – an increase not seen in animals raised in artificial light lacking UVB radiation. Future studies will seek to determine optimal levels of UVB exposure and vitamin D levels in rabbits, guinea pigs, chinchillas and other animals. A report of the study appears in the American Journal of Veterinary Research. "We know that vitamin D is important to vertebrates in that it helps with calcium absorption, but it also has been shown to benefit cardiovascular health and immune function," said Mark Mitchell, a University of Illinois veterinary clinical medicine professor, who led the research. "We know of several types of diseases that can develop with vitamin D deficiency. Some of the chronic problems we see are tooth-related." Other researchers have proposed that low vitamin D plays a role in dental disease in pet rabbits, Mitchell said. "We are doing tooth trims and managing dental disease in rabbits, chinchillas and guinea pigs on a regular basis," Mitchell said. "Weekly, we see those types of cases in our zoo medicine clinical service. It's something that also is seen across the country and internationally. It's a common problem." 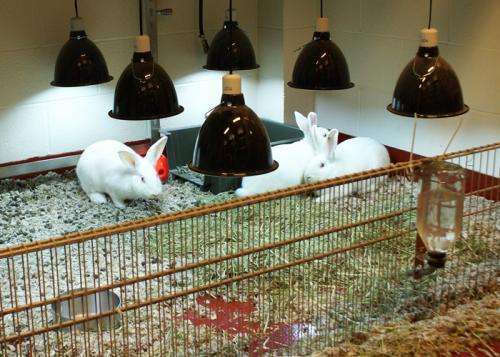 Most laboratory animals and many pet rabbits are not allowed outdoors because of the risks of exposure to predators, parasites and disease, Mitchell said. Windows block most UVB radiation. If the animals don't get sufficient vitamin D from their diet and are never exposed to ultraviolet light, they may become deficient, he said. "As a clinician, I want to better manage these animals, give them a longer, higher quality of life," Mitchell said. Vitamin D deficiency also could undermine the validity of studies using rabbits in research to improve animal and human health, he said. "In human medicine, they're starting to measure vitamin D levels as part of our routine medical exams," he said. "But if we're not doing this with animals that we're using in research, we might be missing a step."